A prosthetic arm/hand attachment for below-the-elbow amputees, which uses the bending motion of the elbow to actuate the bending gripping of the hand, restoring functionality, self-esteem and normality for amputee victims. A solid piece with slots for four fingers, a thumb and channels to guide the actuating wires. It also incorporates a curved underside to allow for a more natural aesthetics and also easier gripping of everyday objects. ... shown in the image above, are comprised of a finger tip (top left), a knuckle piece (bottom right). These pieces are joined by a finger pin (top right) to allow rotation. Once assembled, the finger are joined to the hand using two knuckle bars (bottom left), inserted into each side of the palm to again allow rotation. ... are actuated using orthodontic elastic bands which allow for ease of movement, resistance to fracture and also ensure that the fingers will always spring back into place after gripping. 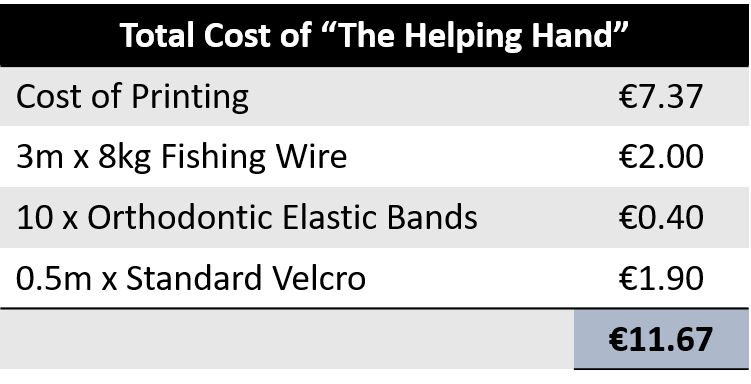 ... you will need: 1 x palm; 5 x finger tips; 5 x knuckles; 6 x finger pins (one extra to join thumb to palm); and 2 x knuckle bars; along with 10 x orthodontic elastics. .. can be printed in two varying configurations as shown on the right. It includes channels to direct the actuating wires, a connecting piece to fit into the palm wrist - which is secured using the wrist bar- and a slot to allow velcro attachment around the arm. ... includes three pivot points for the actuating wires to pull on, thus creating tension to pull and bend the fingers. This is secured at the back of the tricep using velcro also. ... is actually standard fishing wire which is cheap, readily available and highly resistant to fatigue or fracture. The wire is tied to the top of each finger, directed through the channels connecting each arm piece, and around the pivot points. ... appears as shown on the right. Velcro straps are inserted in the slots provided in order to secure it around the arm. Ensure that the point where the wires pass from forearm to upper arm is placed precisely over the elbow joint to ensure functionality.